A fabulous fixed height design, the Loxley Stool Grey exudes a real contemporary elegance. A unique combination of rustic tradition and luxurious detail, the Loxley will easily enhance your bar area with its exceptional charm and sophistication. Ensuring chair-like comfort at kitchen worktop height, the densely padded seat is set on a sprung and belted frame and covered in luxurious grey faux leather. 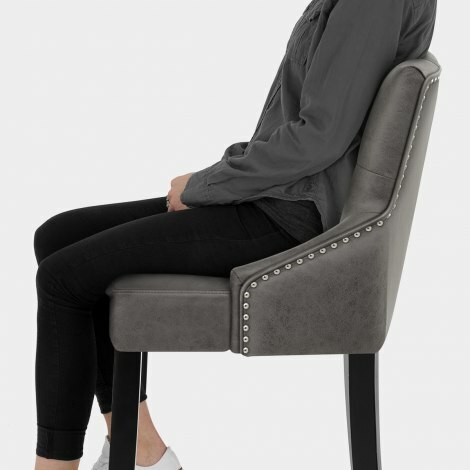 Meanwhile, the tall backrest boasts a wraparound design for additional support along with a decorative button detail on the front and chrome studs on the rear and sides. Supported by a solid wooden frame with a dark wenge finish, the four legs are strengthened by integrated bracing bars that double as a practical footrest. Finished with protective floor plugs on each leg, it is suitable for many spaces. "These stools are lovely quality and well made"
Loxley stools look really elegant and are very comfortable, a great additional to my kitchen island. Easy to assembly, just take care not to scratch the wooden legs in the process! Excellent customer service and the products are excellent value for money and exactly how they are shown very luxurious, sturdy overall I’ll definitely be ordering again and recommending your shop thanks. First class product and a superb service all round Inc. delivery. Thank you. The quality of these stools is excellent. and so easy to assemble. They look really rich and feel warm to touch so very comfortable. 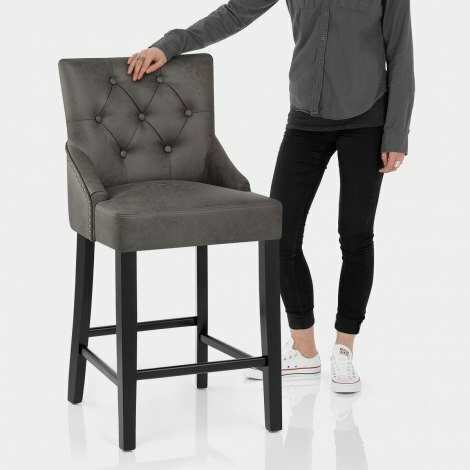 I had expected the stools to be stronger grey and I felt that they had a slight pewter tone. However I was really pleased with them and absolutely love them. I also spoke to customer services and the staff were excellent and really helpful. I would throughly recommend this company.